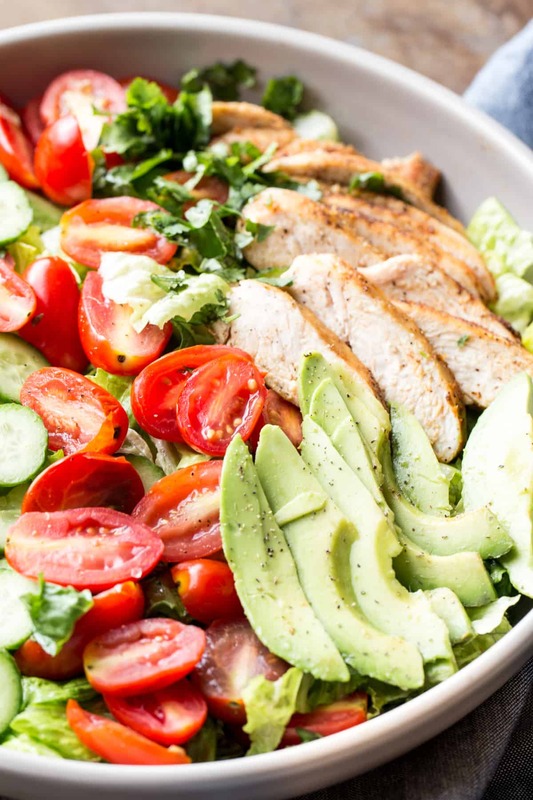 Quick, easy and healthy Romaine Avocado Chicken Salad Recipe with a homemade dressing. Juicy chicken breast served over a bed of Romaine with tomatoes, cucumbers, avocados and a most delicious homemade dressing. 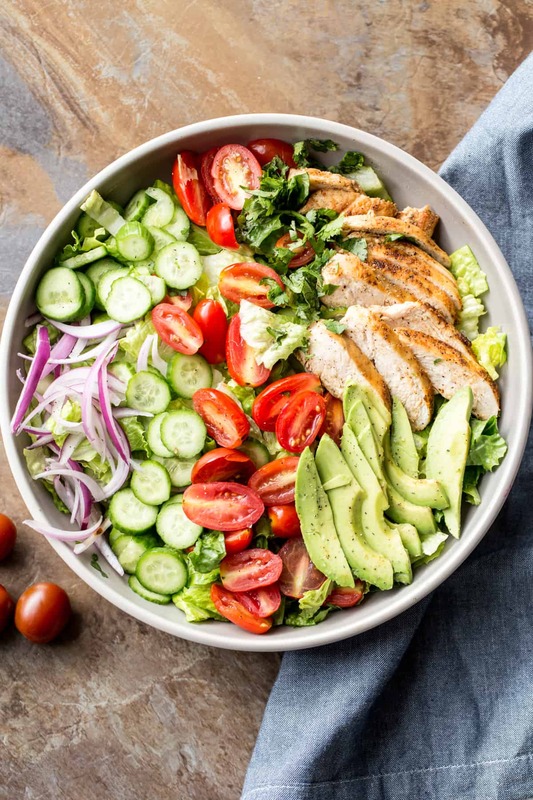 Though the salad uses minimal ingredients and ones you most likely already have in your refrigerator, the results are phenomenal. Juicy chicken breast is wonderful when combined with crispy Romaine, red onion, cucumbers, tomatoes and cilantro. 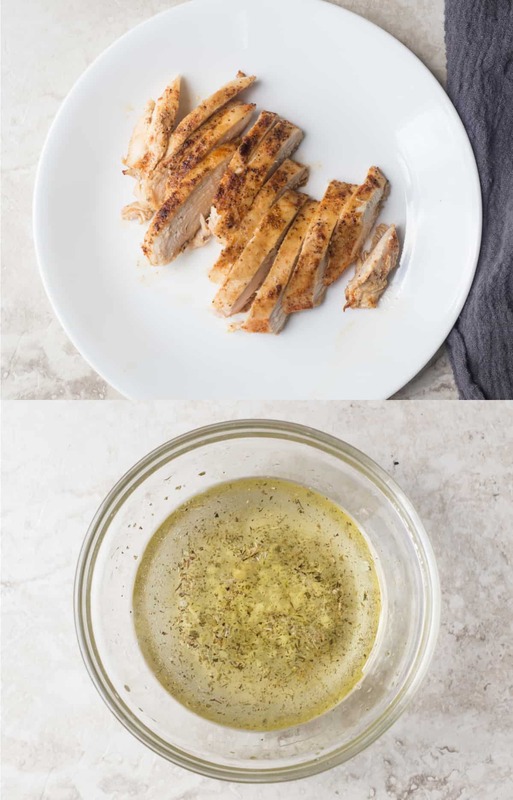 The easy homemade garlic and lemon oil dressing adds so much flavor to the chicken salad. Season chicken breast. Cook chicken. Meanwhile, prepare the dressing by combining the oil, lemon juice, Italian seasoning, garlic, salt and pepper. TIP: The dressing may be doubled and kept in the refrigerator for days to use for other salads. Cut Romaine, tomatoes, cucumbers and red onion. Finely chop cilantro. Slice avocado. Cut up cooked chicken and add to salad. TIP: The chicken can be served warm or cold. Pour dressing over ingredients, mix salad to combine. My most favorite combination for a filling salad would have to be chicken and avocado. There’s just something about the two ingredients in a salad that really work. Though the chicken in this recipe is seasoned with simple ingredients of paprika, garlic, salt and pepper with oil, it’s so juicy and tender. Enjoy the chicken served warm over the salad or cold, whatever your personal preference is. How to Cook Chicken for Salad? The chicken for this salad recipe can either be cooked in a pan or grilled. Grilling the chicken will add even more flavor to the salad. Enjoy the hearty salad with chicken for lunch or dinner. 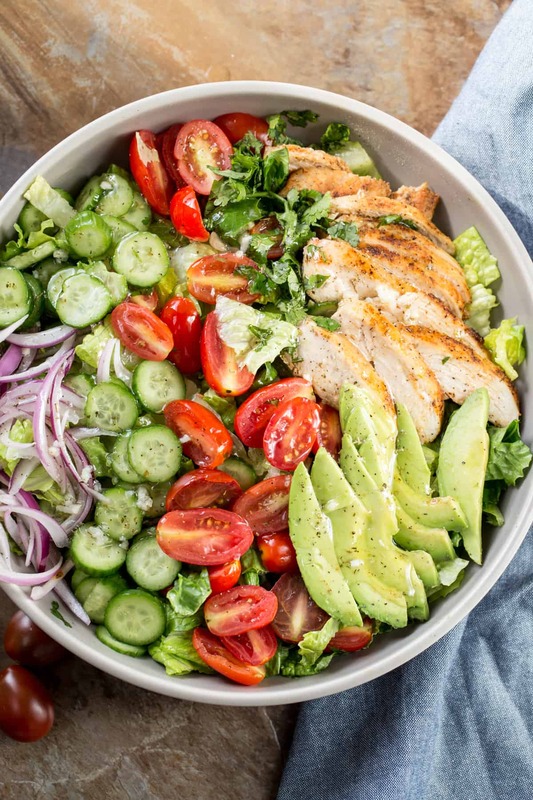 With the homemade dressing, the salad is so light but the added avocado and chicken truly make the salad so filling and oh so satisfying. Caesar Salad Dressing-You’ll never want to purchase store-bought dressing again. BBQ Ranch Chicken Salad Recipe– This CopyCat from Cheesecake Factory is a winner. Romaine Tomato Avocado Salad– So easy to make and so healthy. 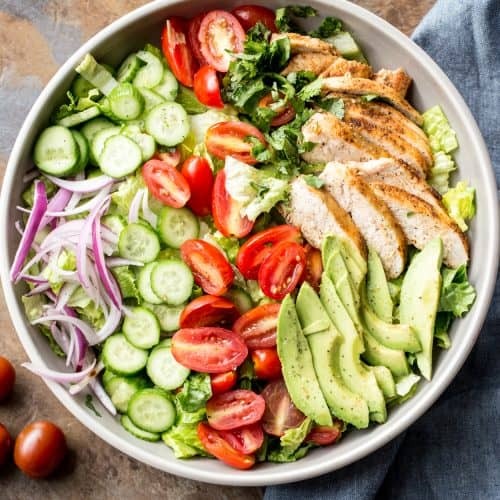 Quick, easy and healthy Romaine Avocado Chicken Salad Recipe with a homemade dressing. Chicken breast served over a bed of Romaine with tomatoes, cucumbers, avocados and a most delicious homemade dressing. Beat chicken breast until even in thickness. In a bowl, combine seasonings for chicken. Season both sides of the chicken. Meanwhile, in a small bowl, combine the ingredients for the dressing and mix until well incorporated. Slice cooked chicken. Add to salad. Drizzle dressing over salad. Toss gently. Enjoy! Thanks for trying the chicken salad recipe, Cameryn. I’m so glad you enjoyed it. I truly enjoy maing this salad because the ingredients are some I always have at home! The dressing is so light and it makes the salad airy and fresh which is so delicious!! Thanks for trying our recipe, Ann! I’m so glad you enjoyed this recipe. It truly is a keeper salad recipe. This look supper good Valentina. Thanks will try this one for shure. Oh, yum! Is romaine safe again? I’ve been dying without it and this really sparks my appetite! !